One of the best things about revisiting a place is the opportunity for extended conversation to deepen friendships. Life as a #SOLOTaxonomy jongleur never lacks excitement but its itinerant nature precludes many opportunities for the deeply textured conversations that happen when you sit down with people at the end of each day. Returning to Denmark for two weeks to work with educators from the Gladsaxe, Gentofte and Rudersal Kommune was one of those revisiting a place “best things”. I especially loved working with Tobias – who helped me translate SOLO ideas each day. 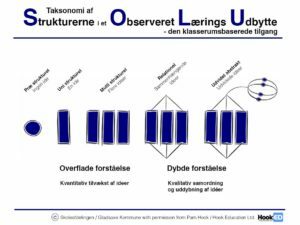 I am certain that Tobias’ SOLO expertise alongside the opportunity for teachers to ask questions in Danish and English helped deepen the understanding and nuance required when using SOLO as a model of learning in classrooms. This in turn prompted many end of the day conversations – how best to approach functioning knowledge? – does “idea” in English hold the same meaning in Danish? when to introduce threshold concepts? – how many command verbs fills a SOLO toolbox? 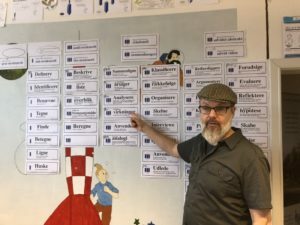 “The Great Wall of SOLO Verbs” (see above) has to be the stand out Tobias resource – it captured the attention of everyone who came into the room -and has been photographed many times. 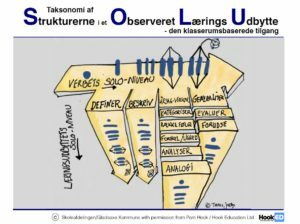 However, Tobias has built many other thoughtful SOLO visuals for Danish teachers exploring the classroom based use of SOLO Taxonomy (see examples below). It was a fabulous two weeks of SOLO conversation – and we marked the end in the most appropriate way.